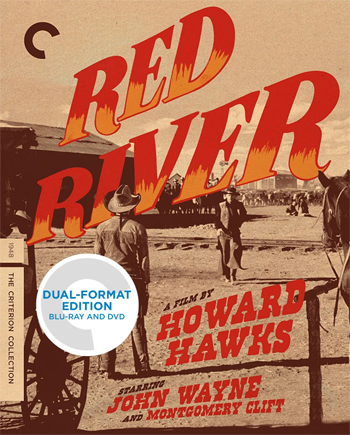 To those who consider westerns mindless shoot-em-ups, and dismiss John Wayne as a talentless reactionary symbol, I can think of no better answer than Howard Hawks’ Red River. And outside of a movie theater, I can think of no better way to see it than in this new Criterion Blu-ray release. In Tom Dunson, Wayne found his first complex, nuanced character–a man who starts out as the movie’s hero and slowly becomes its villain. Even then, he’s an honorable and sympathetic villain, and you understand why he behaves as he does. But you nevertheless root for the other guy. That other guy is the orphan Tom raised as his own, Matt Garth (Montgomery Clift in his breakout role). They love each other as father and son, but under the strain of a long and dangerous cattle drive, their conflicting ways of handling hardship and managing hired hands turns them against onr another. Tom Dunson is a hard and determined man. He killed other men to establish his Texas ranch. In his defense, the other guys always drew first, but they wouldn’t have drawn at all if he was the sort who negotiated. But as the post-Civil War southern economy threatens to destroy all he worked and fought for, he gambles on a dangerous longshot–driving his immense herd across a thousand miles of potentially deadly territory. Matt, ever the loyal son, will help him lead a bunch of hired hands and thousands of cows across mountains and plains that may be infested with rustlers and Comanches. In addition to Matt, Tom has a sidekick, Nadine Groot (Walter Brennan). Older and in some ways wiser than the others, he’s the loyal friend who tries to steer Tom away from his darker tendencies. And Tom’s tendencies get very dark. As the drive drags on and the dangers increase, the men begin to grumble. Tom reacts with anger, pigheadedness, bullying, and eventually violence. But Matt is one apple that clearly fell far from the tree. He treats the men with respect. He listens. He defends them when Tom becomes violent. A confrontation becomes inevitable. This personal story plays out against an epic background. Russell Harlan’s beautiful black-and-white location photography has the mythic look of a John Ford western–a major departure from Hawks’ usual matter-of-fact visual style. And Dimitri Tiomkin’s magnificent score suggests that there’s something going on beyond the story of two men leading a cattle drive. Unfortunately, the film reflects the almost subconscious racism of its time. Early on, Duson–basically at this point a squatter– kills a man trying to protect his employer’s property. I don’t believe that would have been acceptable if not for the convenient fact that both employer and employee are Mexican. Native Americans, of course, are treated as simple savages. Like all great westerns, Red River is about masculinity. But it’s about two kinds of masculinity, and two very different kinds of men. The ending has generated a lot of controversy since the movie opened in 1948. That’s all I’ll say about it. If you’ve already seen Red River, chances are you’ve seen the pre-release version, originally shown in previews. The theatrical version runs about six minutes shorter. After previewing his original cut in front of audiences, Hawks shortened the film. He also replaced narrative intertitles–designed to look like pages in an old book–with first-person narration by Brennan. That that version screened in theaters in 1948. And that, Hawks always insisted, is the definitive Red River. And yet the pre-release version somehow got released and accepted as something like a director’s cut. And most people, myself included, prefer the pre-release version. The intertitles enhance the epic feel, while Brennan’s narration just gets annoying. And the ending, considerably shorter in the theatrical version (for legal reasons explained in the extras), works much better in the longer cut. In the theatrical version, everything gets resolved too quickly. But you can make up your own mind. Criterion gives us both cuts. Criterion packages Red River in a thick cardboard box containing a disc sleeve and a book. The book is Borden Chase’s short novel, Blazing Guns on the Chisholm Trail, that Chase and Charles Schnee adapted into the Red River screenplay. The disc sleeve contains four discs and another book. Well, a 28-page booklet with two articles on the film and both film and disc credits. The discs are stacked, two on the left, and two on the right. You have to remove one disc to get to the one beneath it. This configuration always makes me worry that I’ll damage a disc. I haven’t yet. The two discs on the left are DVDs; on the right, Blu-rays. Following Criterion’s current policy, everything is on both discs. I only looked at the Blu-rays. The first disc contains the theatrical cut, plus a few extras. The second contains the pre-release version, with additional extras. I don’t know why they didn’t use Blu-ray’s (and DVD’s) seamless branching feature to put both films on one disc. There would probably have been enough room for all of the extras, as well. Red River is a beautiful example of 1940s black-and-white photography. Much of the film was shot in twilight or around campfires, requiring good shadow detail. The many long shots, showing wagons, galloping horses, and cows moving across vast stretches of open land require fine detail to make their impact. Criterion’s 2k transfer manages all of this. Ninety-five percent of the time, this Blu-ray (or perhaps I should say these Blu-rays) looks great–from the mountains to the clothes to the faces seen only in shadow. Unfortunately, one of Red River’s most spectacular shots–a slow pan across the cattle just before the drive starts–looks horrible. In both versions, this shot is ruined by what looks like a combination of heavy film grain and digital artifacts. The PCM mono soundtrack is exactly what it should be. It doesn’t try to sound like anything beyond an optical soundtrack from 1948. But it sounds like a pristine soundtrack of the period, played in a really good theater. By Criterion standards, these disappoint. There’s no commentary track, and no real documentary. Mostly you get interviews, some only in audio. About the Versions: Just a paragraph of written text about the two cuts. Peter Bogdanovich on Red River: 17 minutes. The film historian and sometimes director explains Hawks’ esthetics and simple visual style. He also discusses the two versions. Hawks and Bogdanovich: Criterion divided this 16-minute this audio interview from 1972 into 7 section. It’s worth a listen. I was surprised to discover that Hawks regretted shooting the film in black and white. Personally, I’m glad he did. Molly Haskell: 16 minutes. The critic and historian discusses Red River’s gender issues, and Hawks’ approach to genre. Like me, she prefers the pre-release cut. 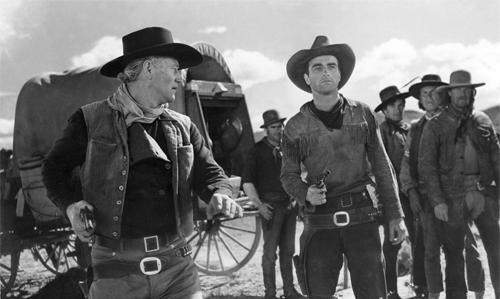 Lee Clark Mitchell: 13 minutes, The author of Westerns: making the Man in Fiction and Film talks about the western as a literary and cinematic genre, masculinity, and ties it all to Red River. Borden Chase: 10 minutes. Audio excerpts from a 1969 interview, separated into four chapters. He talks a good deal about how Hawks changed the ending. He wasn’t happy with that. Lux Radio Theatre: 59 minutes. Radio adaptation with much of original cast. I didn’t listen to it. Red River is already on sale. Don’t you find the daylight scenes in Criterion’s “Red River” (both versions) bleached out? I do and it’s a film I’m very familiar with. I’ve seen it numerous times over the years on 35mm and have owned it on 16mm, Beta, Laserdisc and the previous standard DVD. Check the review on http://dvdbeaver.com and look a the comparative screen grabs. It’s immediately obvious in the first scene when John Wayne leaves the wagon train. Night scenes are fine but daylight scenes have next to no skin tones and are very washed out. Very disappointing, especially since it’s from Criterion! Another thought…do most of us really need or want both extra Blu-rays and DVDs in a single premium priced package nowadays! If you’ve got a Blu-ray player why would you ever want to look at the standard DVD version again? Blu-ray players are so cheap most of us now have them in our secondary viewing setups such as bedrooms. Lastly what passes for a theatrical trailer on “Red River” is really just a made for video job and not nearly as good as the original UA trailer. Good prints of the latter are not common but not unknown either. I’ve even seen good ones on YouTube. Want to see the best HD version of “Red RIver”? The old but superior transfer is playing this month and appears regularly on HDNet Movies. Dish TV only gives HDNet to me in 720p but it still surpasses the visual quality of this disappointing Criterion release. Just my humble opinion of course! The only scene that I felt was bleached out was the mutiny scene, and I thought that worked dramatically. Of course, I don’t know if that was Hawks’ intent. About the DVD/Blu-ray packaging: The idea is that you might have a Blu-ray player in the living room, but only DVD on the laptop. This packaging started originally with children’s films, since kids are more likely to watch a movie in various situations. But hey, the kids are growing up.